Wholesale Trader of a wide range of products which include storage tools trolley. 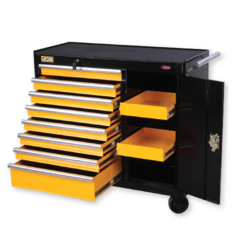 We are successfully ranked as the well-known trader, distributor and supplier of an exclusive range of Storage Tools Trollery (Workstations and Storage Tools). The given range of tools are developed consuming optimum grade raw material and highly advance technologies. In order to make certain the quality of these tools, our vendor’s quality experts check these in terms of quality. Additionally, these tools are highly valued in the market for their excellent quality and durability.